The 15 Best Bakeries in Oregon! From mom-and-pop shops brimming with old-fashioned goodness to patisseries worthy of a place in the most stylish section of Paris, Oregon’s got bakeries. You’ll find small town surprises and urban delights among our favorite 15 Oregon bakeries. Established as in-house neighborhood confectionary by a Lutheran minister’s wife in 1924, the current owners of Helen Bernhard Bakery strive to keep its old-school goodness alive. A wedding cake from Helen Bernhard Bakery is a Portland tradition, and the specialty Barbie cakes thrill many young Portland girls on birthdays and other important occasions. Sticky buns, biscuits, and scones are just three of the delectable delights you’ll find at this off-the-beaten path artisan bakery. Try the French toast made with in-house baked biscuits and you’ll be looking for reasons to visit Central Point for years to come. If you think healthy desserts is an oxymoron, you haven’t savored the raw lemon bars at Eden Bakery. Other heavenly concoctions include rosewater-infused pistachio cake, millet bars, and both sweet and savory scones. Established in 1993 in a converted garage in Eugene’s arty Whitaker neighborhood, Sweet Life Patisserie has evolved into a bustling bakery with two locations that nonetheless stays true to its artisan roots. Try the coconut-almond chocolate pie with a chocolate cookie crust next time your sweet tooth calls for something completely decadent. A day on the Oregon beach isn’t complete without stopping at Sweet Magnolia Bakery in Florence for a slice of white chocolate cake with berry compote. Or try a classic coastal confection make with salted caramel and buttercream. Add a continental accent to a day of wine tasting in the Yamhill-Carlton Viticulture Area with a stop at Carlton Bakery. 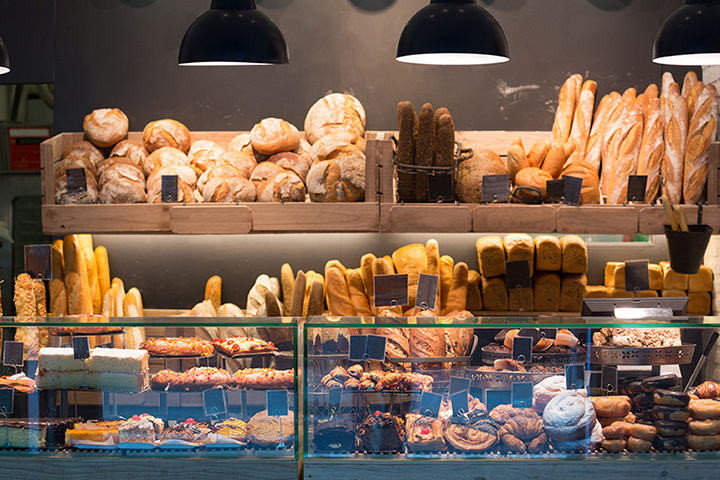 You’ll enjoy handcrafted breads and pastries baked in true European style. Try one of their warm cinnamon croissants with an ice glass of blueberry lavender lemonade while taking a break from exploring the region’s many fine wineries. Enjoy croissants so classically French you’ll think you’ve died and gone to Paris at this 35-year-old Eugene Bakery. Wheat-free selections include raspberry mousse cake, oatmeal walnut cookies, crème brulee, and a variety of mousse cups. Conveniently located on Oregon Highway 101, Depoe Baykery offers more than just a view of a picturesque fishing harbor and stunning coastal vistas. Try their famous coconut macaroons or enjoy a slice of roasted sweet potato cheesecake with maple cream while watching the boats drift in and out of the bay. Black Forest tortes, champagne cupcakes, Italian and New York-style cheesecakes, cream puffs, éclairs, and petit fours are just a few of the taste that await you at this Corvallis culinary classic. Be sure to pick up a package of their freshly baked buns for that barbecue you’re planning, or take home a coffee cake croissant to share with family and friends by the fire on a blustery Oregon day. Showcasing traditional Viennese style baking, Gerry Frank’s Konditorei has served as a Salem staple for over half a century. No classy Salem soiree is complete without at least one of Gerry’s cakes, but you don’t have to wait for a special occasion to see what all the fuss is about. Stop in for a slice of chocolate fudge truffle cake or an Italian cream cake laden with pecans and coconut and iced with maple creamed cheese frosting. Diehard chocolate buffs can opt for a piece of Barney’s Blackout, which features five layers of dark chocolate goodness with rich fudge frosting. You’ll understand why they chose their name after one bite of a Marionberry scone at Pure Bliss. Their maple-glazed cinnamon rolls are another reason to make this Central Point café a favorite stopping place. Try a piece of banana or Guinness cake for an extra special treat. Who can resist stopping at a place that calls itself Fat Cupcake? This Oregon City cupcake concept became so popular that they opened a second location in nearby Portland, so be sure to give both places a try to see if you can figure out which one makes a better Mona Lisa–that’s classic white cake, strawberries topped off with vanilla buttercream frosting in the shape of a rose. Serious bread connoisseurs find their way back to Pearl Bakery time and time again. Traditional European breads are well-represented here, such as classic French bread, panini, and Pugliese. They also make a delicious whole grain bread teeming with nuts and seeds. Bendites know which side their bread is buttered on, and that’s whatever side was baked at Le Magie Bakery and Café. Check out their weekly bread baking schedule to ensure that you don’t miss out on your favorites, such as babka bread, black Russian rye, 10-grain Tyrolean bread, or Venetian olive bread. Treat yourself with a fresh strawberry tart or order a custom cake for a special occasion. Don’t miss Village Baker of Ashland If you appreciate artisan breads prepared using time-honored traditions. You won’t find sweet desserts here–just loaf after loaf of finely crafted, mouthwatering bread. Specialties include cranberry-hazelnut, Italian sourdough, California black olive, French country loaf, and ciabatta. Along with its huge variety of traditional breads, Village Baker features a different artisan bread each day of the week.